This probably isn't the most subtle send-off for the G Wagon. Not that we're complaining. When you think of Maybach, you think of sleek, high-end luxury sedans that cost a small fortune. Not brash, 621 horsepower off-roaders. But that’s exactly what we have here with the menacing Mercedes-Maybach G650 Landaulet, a unique mash-up of Mercedes-AMG and the revived Maybach sub-division. And just as leaks suggested, it’s a convertible, V12-powered, 621 horsepower monster, built as a send-off to the long-running Mercedes G-Wagon and a successor to the G63 AMG 6x6 and G500 4x4 Squared. 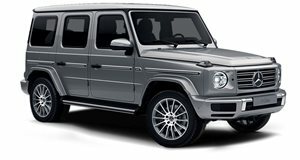 “The off-road icon demonstrates that the definition of unique luxury can always be taken to a new level.” That’s Mercedes’ justification for this Frankenstein creation, which combines the G-Wagon's extreme off-roading capabilities with the ludicrous luxury you expect from a Maybach. First things first: the G650 Laundaulet is considerably massive, measuring 17.3 feet long and 7.2 feet high, with an extended wheelbase of 11.15 feet and extraordinary ground clearance of more than a foot and a half. There are no compromises to performance however, thanks to AMG’s biturbo, 6.0-liter V12 engine delivering 621 hp and 737 lb-ft of torque. Performance stats have yet to be revealed, but considering that the Laundaulet produces the same power output as the regular AMG G65, expect to reach 0-62 mph in around five seconds. Make no mistake, though: this is still an off-roader first and foremost. To make it capable of tackling any type of terrain you throw at it, the G650 Landaulet has been fitted with similar portal axles to the G63 AMG 6x6 and G500 4x4 Squared, as well as 100 percent differential locks and a low off-road ratio transfer case. Inside, however, it’s clear that the G650 Landaulet is worthy of the prestigious Maybach name. While the driver and passenger get a proper roof, rear passengers can enjoy an open cockpit experience thanks to the electronically retractable fabric roof. Those sat in the back will be travelling in crisp comfort too, since the G650 Laundaulet has the same sumptuous rear seats as the S-Class, which are reclinable and can even provide a soothing hot-stone massage. You also get a calf rest, thermal cup holders, and two tables which fold out of the center console with leather inserts to allow for a “comfortable writing surface.” You can never accuse a Mercedes of not being well equipped. Mercedes-Maybach describes the G 650 Landaulet as “the most exclusive form of stylish open-top motoring.” “Exclusive” is the primary word here because only 99 examples are planned for production. No pricing details have been revealed yet, but you probably need to be a celebrity to afford one. 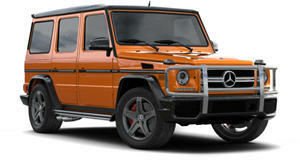 Expect to see the G650 Laundaulet at the Geneva Motor Show next month. Because let’s face it, you won’t be able to miss an off-roader of this size.